This community led project is creating a sustainable tourism offer based around the Boudicca Way path. Activities include: improving the path itself, encouraging local business partnerships and creating a website to promote the area. 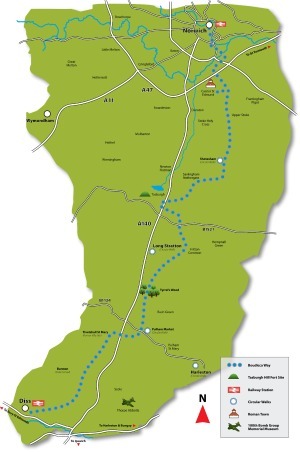 The Boudicca Way, an existing tourist route in Waveney Valley, lacked an overall strategic approach to further its development and dissemination. 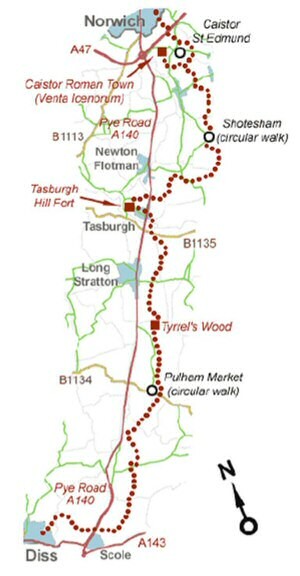 This project aimed to rectify this by establishing a long distance footpath between Norwich and Diss, which meanders through the surrounding area, promoting a collaborative partnership of local businesses along the route. This will have the effect of developing the local economy. The overall objective of this LEADER project is to encourage tourism on the existing Boudicca Way route. With more specific objectives being to: i) actively market the Boudicca way route and raise awareness of the wider Waveney Valley area as a tourism destination; ii) establish an innovative website with information on Boudicca Way and what the surrounding area has to offer to tourists; iii) open up new markets, increase the number of tourism businesses and promote local business partnerships. The main activities of this project are: i) establishing the footpath (approx. 36 miles) between Diss and Norwich. The route follows public rights of way, quiet country roads and stops off in picturesque villages; ii) developing restricted mobility tourist accommodation; iii) setting up a website to publicise the route; iv) establishing collaborative partnerships between local businesses along the route that will work to promote the Boudicca Way as a genuine option for visitors. The project has sustainability at its heart, thus it promotes; green travel options, responsible tourism, and helps partner businesses achieve accreditation in the Green Tourism Business Scheme. In addition, small-scale improvements will result in two extra rooms for visitors to the area, one being suitable for visitors with restricted mobility. The completed website will enable visitors to plan an itinerary chosen from the various accommodation, food, and local interpretation options available. Although still in progress, this project has already shown that when businesses come together they can reap the benefits of partnership; as collaborative work to promote a new tourism offer is often more effective than working alone. On top of this, an increase in tourism and recognition of what an area, such as the Waveney Valley, has to offer provides a wide variety of benefits to both local tourism businesses and those who would otherwise not consider themselves tourism based. Waveney Valley, Norfolk & Suffolk.